Kerry James Marshall creates race-conscious art that challenges the historical exclusion of African Americans from the artistic canon. 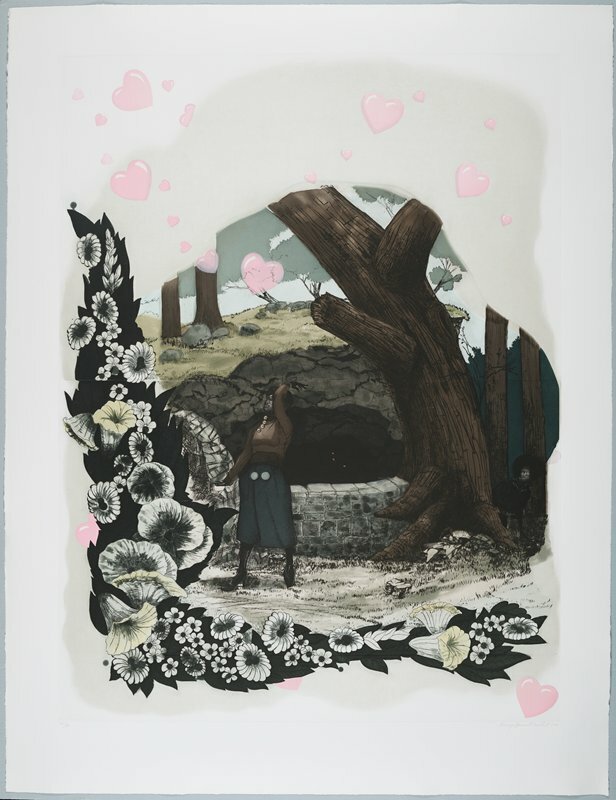 Vignette (Wishing Well) is thematically related to the artist’s long-running series of “vignette” paintings that mimics well-known art historical genres. Here, he adopts narrative pictorial conventions commonly seen in French Rococo painting of the 1700s, a style that emphasized frivolity and the ideal of elegant prettiness. The woman and man are characters in a familiar story of voyeurism: while a woman throws coins over her shoulder into a wishing well, a man spies on her from behind the rocks and trees. Surrounding the central image, floral borders and heart-shaped balloons serve as purely decorative flourishes. Most notably, Marshall has replaced the usual white figures with black figures, both to expand understanding of the racial biases embedded in art history and to normalize the presence of black subjects within the visual arts.